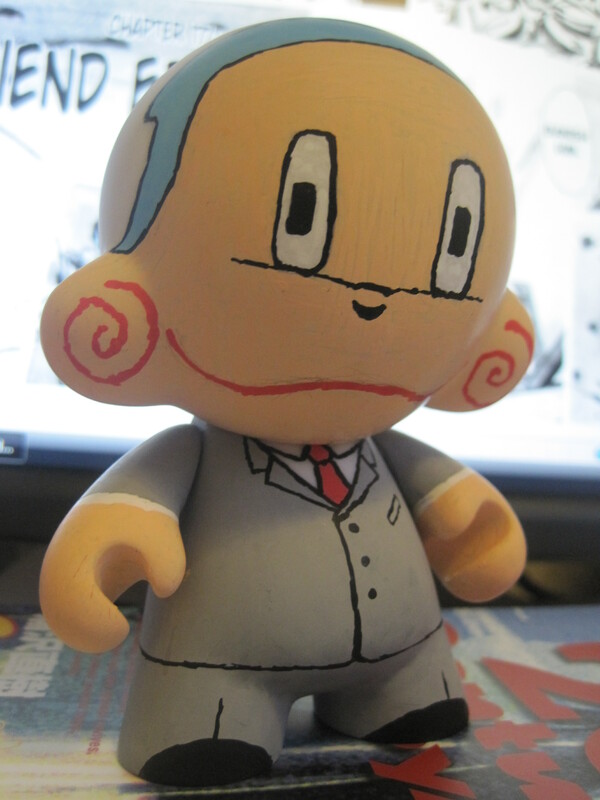 Another trip to Munnyworld as I take on a Rooz toy. The Rooz is shaped like a legless kangaroo? or maybe a ghost chipmunk? 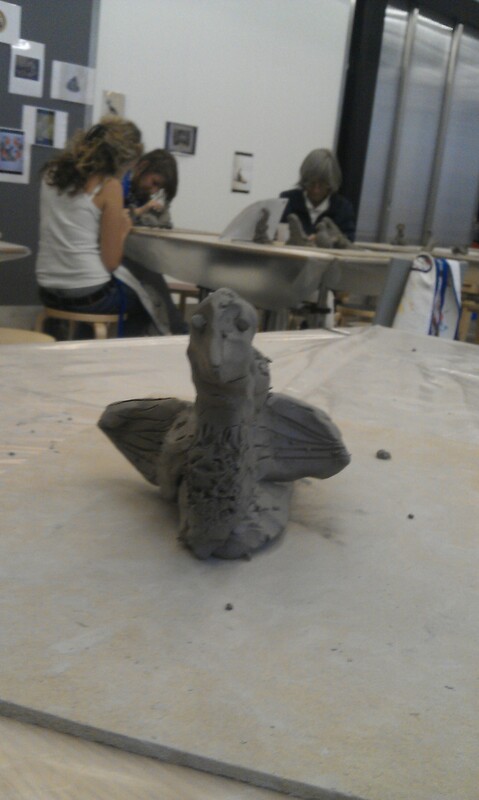 And so it has proved to be the most tricky to design so far. 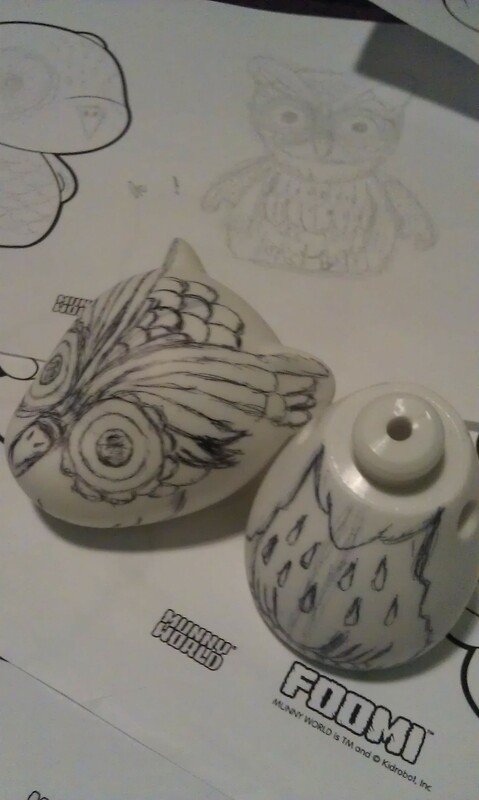 In the end I decided to just ignore the shape completely and overlay an owl motif onto it’s odd little body. 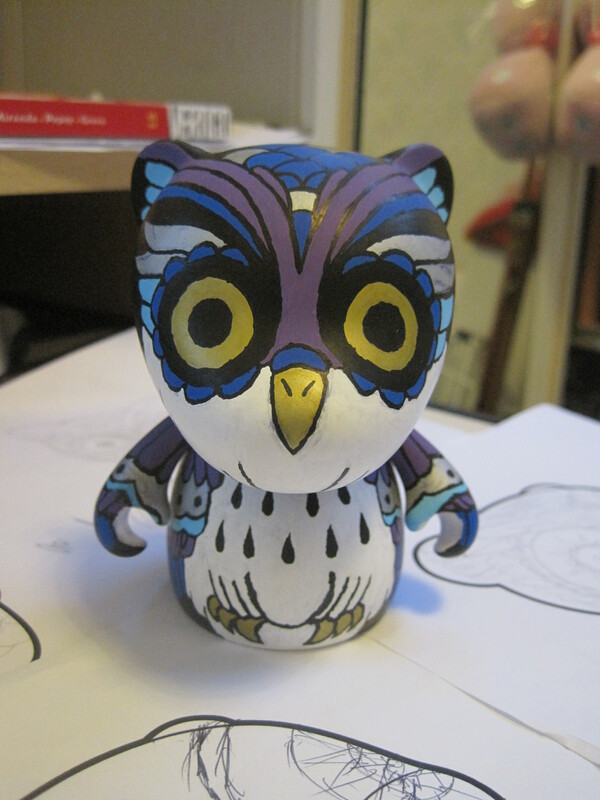 I wanted an owl because earlier in the year Kidrobot released a limited edition 8″ dunny by Nathan Jurevicius which was one of the coolest things I’ve seen this year. 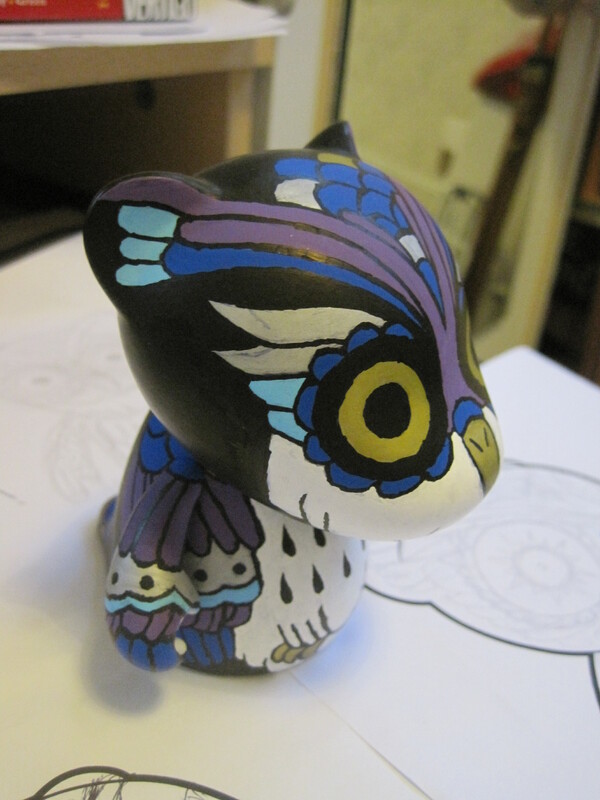 It was an owl design based on a creature from Lithuanian folklore with geometric patterned eyes, soft flocked surface and wings instead of regular dunny arms. As my birthday came around Doff tried to buy one for me, but unfortunately they had sold out, so then I thought I might try to make something similar. I didn’t want to copy NathanJ’s style too much, plus I wanted more detail so I also took inspiration from traditional/neo-traditional owl tattoo designs, especially those by Ashley Love. She does fantastic work and really has an original approach to one of tattooing’s most well worn subjects. My final product isn’t anywhere near as good as anything produced by these two artists, but I like it, and it’s the most accomplished piece of vinyl painting I’ve done so far. 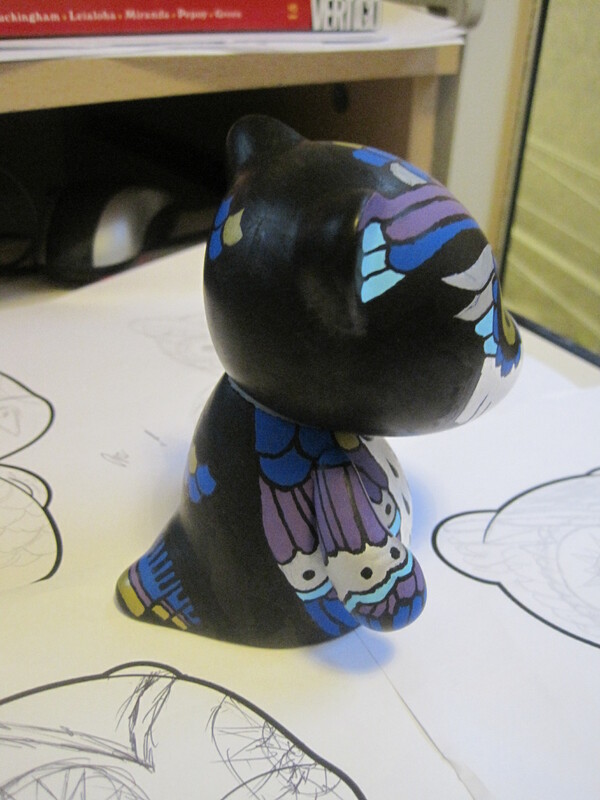 For this toy I did the initial guidelines on the vinyl with a Biro, as recommended by Gangtoyz. Lines were much clearer than pencil marks and they didn’t smudge at all. I also wore latex gloves for the entire time I was painting, which seemed to make a great difference to how well the paint held onto the surface. As always, the paints used were Posca paint markers. Thanks for looking, and you can send me suggestions for what to make next in the comments. Very sorry but I’ve been insanely busy this week and unable to bring you an episode of Theatre of The Unconscious. 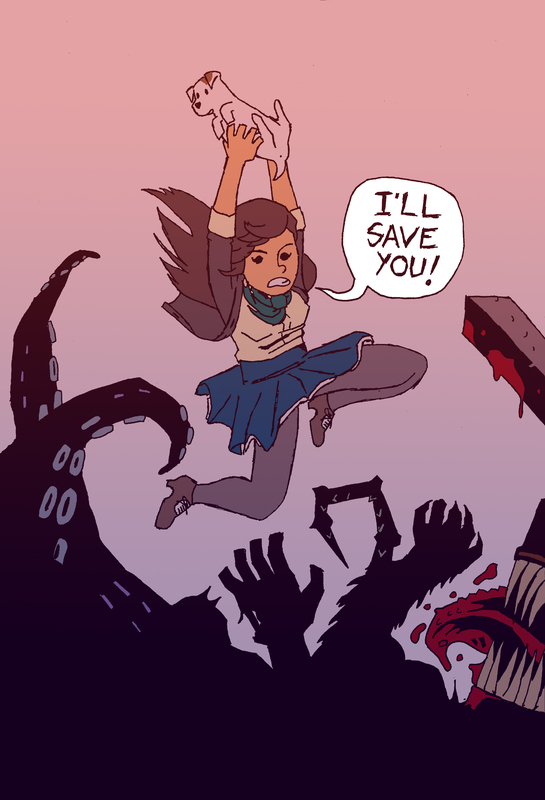 I promise I’ll be back next week and you won’t want to miss the action-packed comic I’ve got planned. In the meantime I’ll give you a sneak peek of my next vinyl toy project and some pictures of cool stuff from a recent visit to the Victoria & Albert Museum, probably my favourite place in all of London. The header pic is from a sketch of Doff in samurai armour that I drew in the Japan gallery. 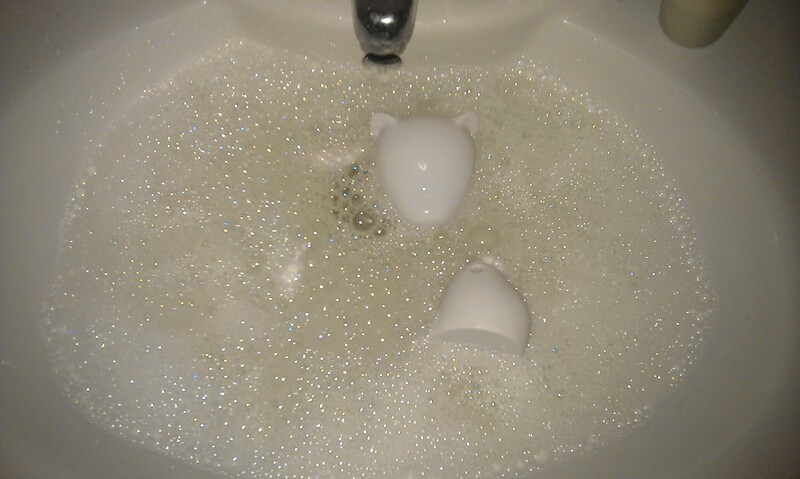 Always give your vinyl toys a soapy soak before working on them. 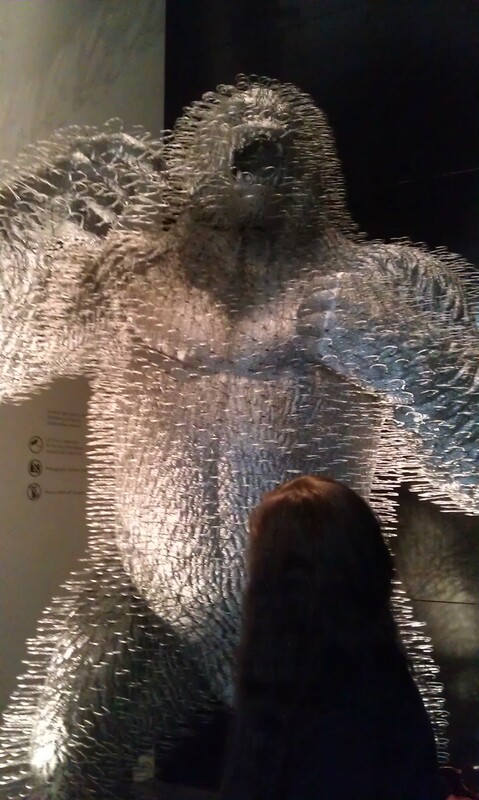 Doff checks out a gorilla made entirely of wire coat hangers, part of the Power of Making exhibit. 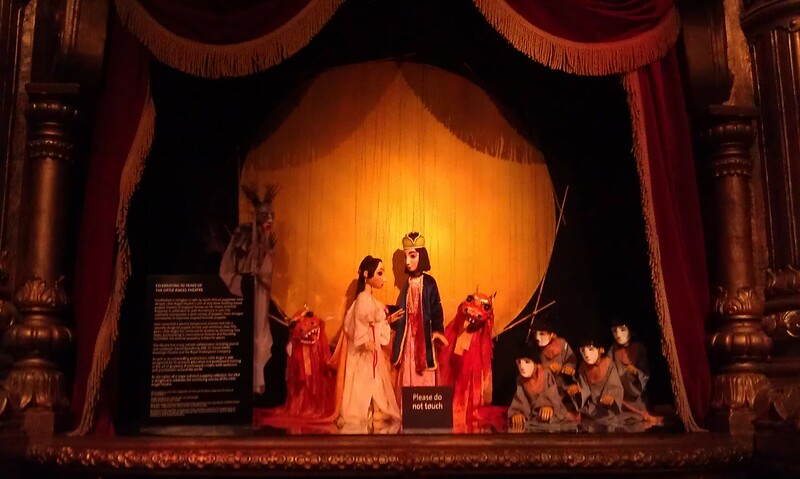 Puppet theatre behind the current Annie Lennox exhibition. 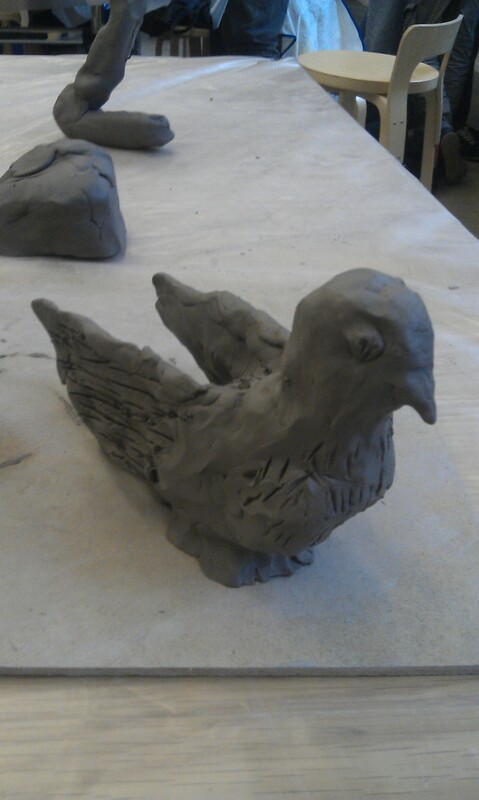 I make a clay pigeon (geddit?) 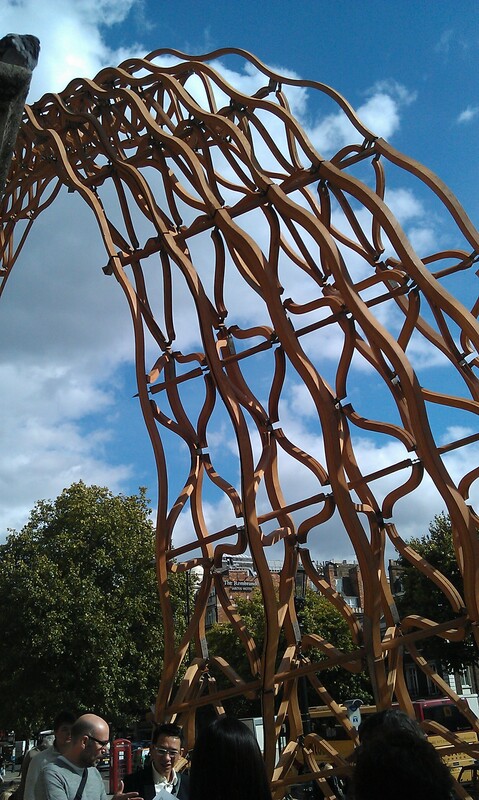 at the design festival. Osamu Tezuka has an almost inexhaustable library of genius work to his name but I want to share with you some of my own personal favourites, either created or inspired by the godfather of Japanese comics and animation. I can’t honestly say I’ve even managed to scratch the surface of what he has to offer but I hope this list (in no particular order) gives you some idea of what’s available and if you’ve never seen his work before, I would strongly encourage you to pick up any one of these if you’re even remotely interested. If you do, you’re almost guaranteed to become as big a fan as I am. 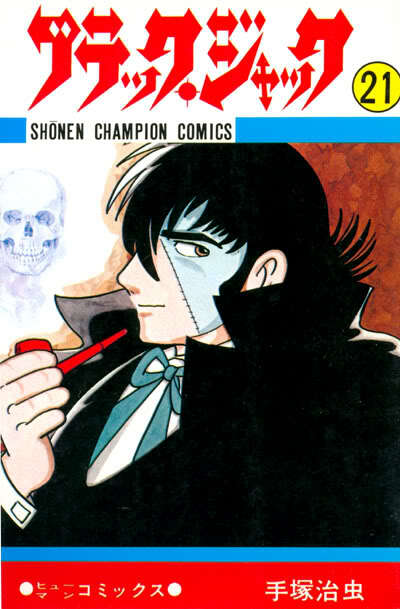 This long running manga series stars Black Jack aka Kuroo Kazama, described on wikipedia as a “medical mercenary”, an exceptional surgeon of superhuman skill who sells his services to whoever can afford them. 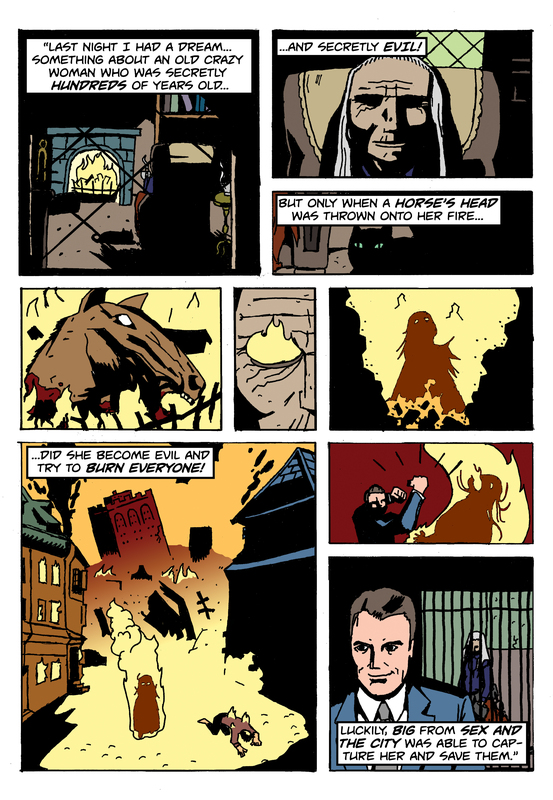 The stories are usually dark in tone and feature Black Jack as a kind of dark avenger, operating (pun intended) outside the law, often saving the downtrodden whilst punishing those he considers immoral or corrupt. Tezuka was trained in medicine and uses his expertise in the depiction of the medical scenes, lending a sense of reality to the largely fantastical scenarios. Vertical Press has published English versions of the first few volumes with really nice minimalist cover designs worth looking out for. Available as a single volume with a Chip Kidd designed cover, this thriller deals with the relationship between a respectable banker who lives a double life as an insane murderer/kidnapper and the priest to whom he confesses his crimes. The two men are lovers linked by a mysterious past which may eventually lead to the destruction of all life on earth. 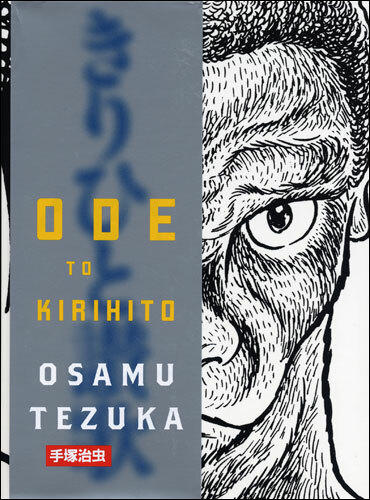 The film adaptation of Tezuka’s 1949 sci-fi manga, said to have been originally inspired by seeing the poster for Fritz Lang’s classic film of the same name. Directed by long time Tezuka collaborator Rintaro, I believe this to among the best anime films ever made. Visually stunning with great use of combined CG and traditional animation, it tells a tale of class warfare and discrimination between coexisting humans and robots in the future. Bursting with well-realised characters and relationships, the above trailer doesn’t quite do it justice. I absolutely loved this Game Boy Advance title when I got my hands on it. From legendary developer Treasure (Ikaruga, Gunstar Heroes, Freak Out) comes a supremely polished shooting game starring Tezuka’s most famous creation. Featuring loads of Tezuka’s other characters too, this game is great fun and ultra challenging (in a good way) on any difficulty setting above easiest. The Gamespot guys do a good job of summing it up in the video. This recent manga series created with the cooperation of Tezuka’s estate, is a reinterpretation of a classic Astro Boy arc – The Greatest Robot on Earth. 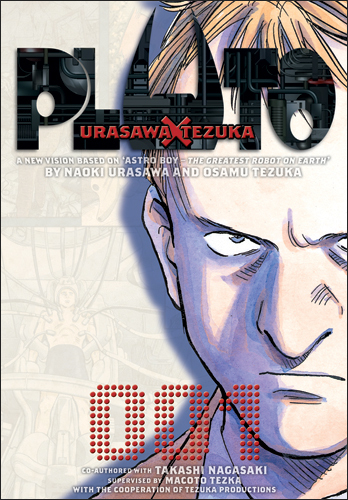 Retold by Naoki Urasawa (Monster, 20th Century Boys) as a murder mystery tale for mature readers, it adds new dimensions to previously familiar characters and unites one of my favourite manga creators of modern times with his spiritual ancestor. 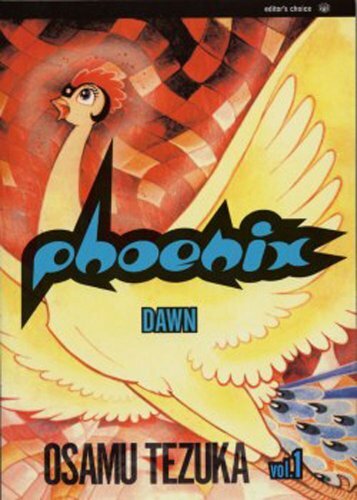 Unfinished at the time of his death, Phoenix was considered by Tezuka to be his life’s work. The series of comics move from prehistoric times into the distant future and stretching out into deep space, all held together by themes of death, eternal life and reincarnation. The volumes Resurrection and Nostalgia have probably stayed with me the most but they are all worth seeking out. A 1984 animated short by Tezuka and his animation studio. Fun, innovative and full of cool little touches. A young doctor contracts the disfiguring and deadly disease he is investigating and ends up resembling a dog-like creature. Following his transformation he embarks on a journey of vengeance and redemption, trying to maintain his dignity as a human being despite his affliction. I’m including this because it involves one of my favourite musicians, Shinichi Osawa. Alongside fellow producers Taku Takahashi and Tomoyuki Tanaki they form the electronic music group Ravex. Their album Trax, made to celebrate the 20th anniversary of the label Avex, is an excellent dance-pop record featuring loads of J-pop stars, and includes artwork and animation by Tezuka Productions. I had the pleasure of seeing the group DJ live in Fukuoka and it was indeed a treat. For this post I have a brief look at Sidi Larbi Cherkaoui’s TeZukA which had its première performances at Sadler’s Wells in London a few weeks ago. Stirred back into recollection by the performance, in the next few days I’ll also be listing a few of my favourite Tezuka or Tezuka derived/inspired works and explaining why I think they’re worth checking out. TeZukA is a show which combines dance, martial arts, calligraphy, video projection effects, science lectures, and Japanese history into a celebration of Osamu Tezuka, Japan’s legendary cartoonist and animator. 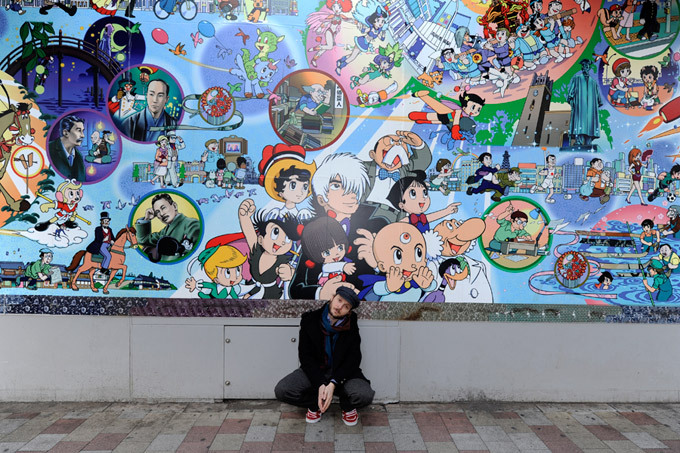 It features interpretations of his famous characters such Astro Boy, Black Jack, Buddha, Hyakkimaru as well as Tezuka himself, with trademark beret and glasses. The mostly traditional themed music is by Nitin Sawhney (whom I remember from his excellent soundtrack to the game Enslaved – Odyssey to the West), played live by musicians on one side of the stage. As a love letter to Tezuka’s work and influence it works really well and you can clearly see that choreographer Cherkaoui cares deeply about the stories and characters he’s putting on stage, and as a viewer you get to appreciate the style and technique in Tezuka’s artwork as panels and pages from his comics are projected and animated onto the background and on giant scrolls which roll down from the ceiling. However, I can’t help but feel that for those unfamiliar with Tezuka, the performance would lose a lot of its impact as a lot of the piece is celebration without that much explanation as to why these things need celebrating. With my extremely limited knowledge of dance I can’t comment too much on the choreography but to say there were some interesting scenes but largely I was more interested in what was going on around the dancers, with the exception of Astro Boy’s entertaining robotic moves. Discussing the performance afterwards, one of my more dance savvy companions shared their opinion that “often the themes and ideas behind contemporary dance are more interesting the dancing itself”. I also have to criticise the length of the piece which seemed to loose steam soon after the mid-point intermission, despite a vigorous drum & bass breakdown towards the end. 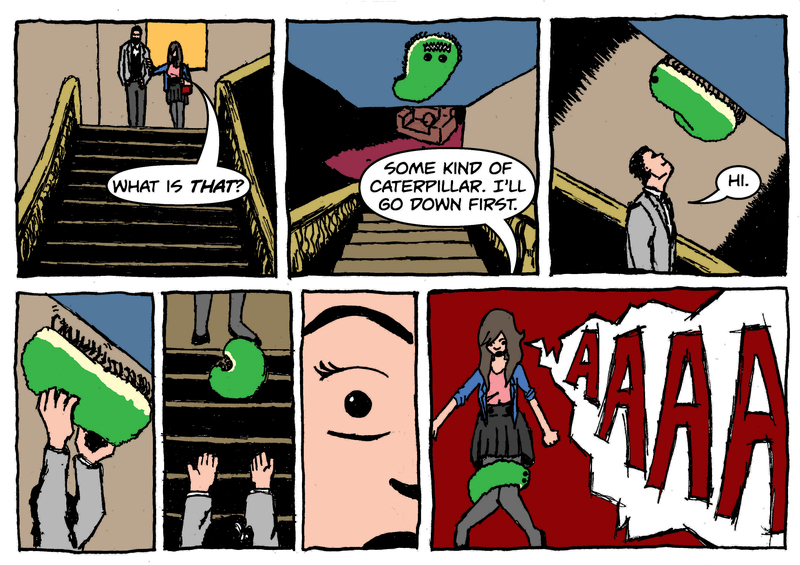 The fifth in a series of comics detailing the slumber-time adventures of a madwoman. This week’s comic is a bit of a cheat in that it only has one panel. But I reckon it’s a pretty good panel, and it tells you the whole story. Nothing much interesting or comprehensible happens in the rest of the dream but at least I got the chance to draw one very cool image. That’s Doff rescuing my dog, Suzie, who can be seen in the post banner above too. In-progress pics and notes on some new inking and colouring techniques after the jump. 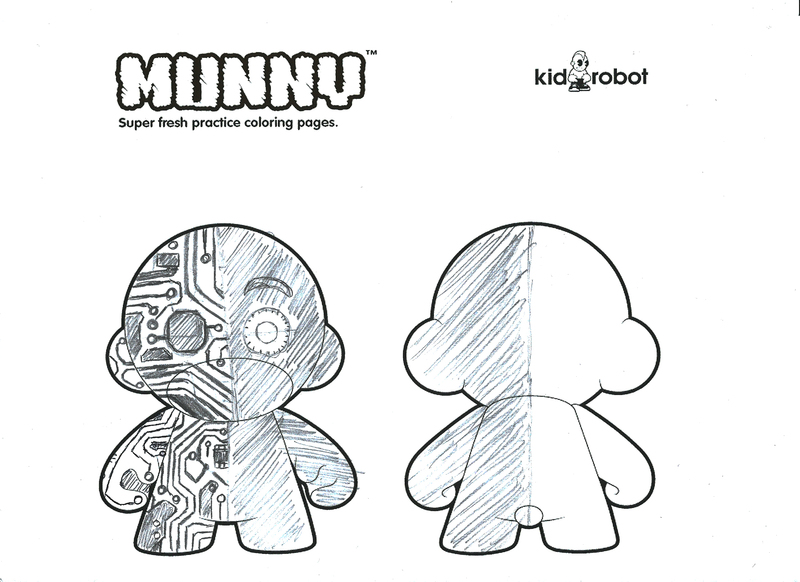 Another Munny toy project. 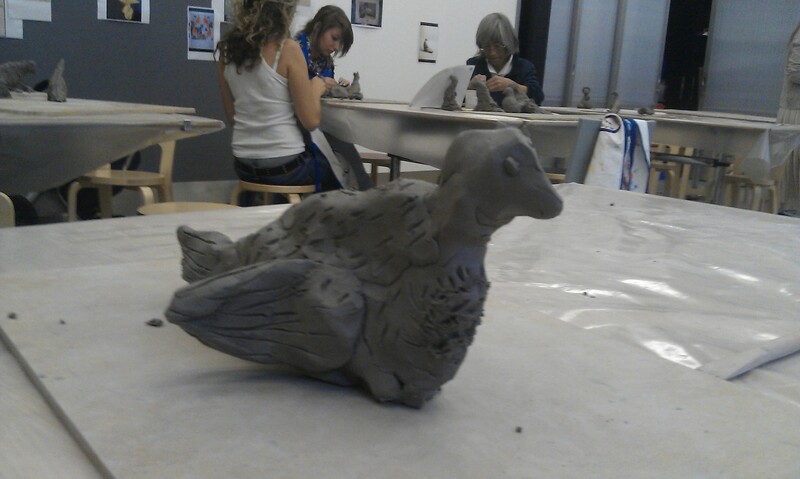 This time I took inspiration from Sidi Larbi Cherkaoui’s TeZukA production which I went to see a few weeks ago. I’ll most likely write about the show for my next piece but for now here’s a toy I quickly put together which took design ideas from the poster for the performance. Here’s my initial sketch. The fourth in the series of Doff’s dreams translated into graphical goo. This one is a bit rougher than the last because I didn’t have too much time to spend on it but I hope you enjoyed it anyway. 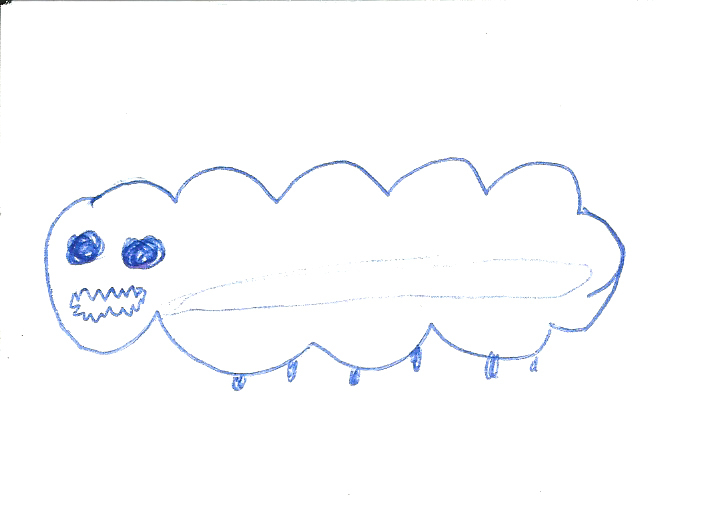 Below is a sketch of the beast provided by the dreamer herself, for use as reference for this episode. Note the “pumpkin” mouth. Thanks for looking, see you next time. 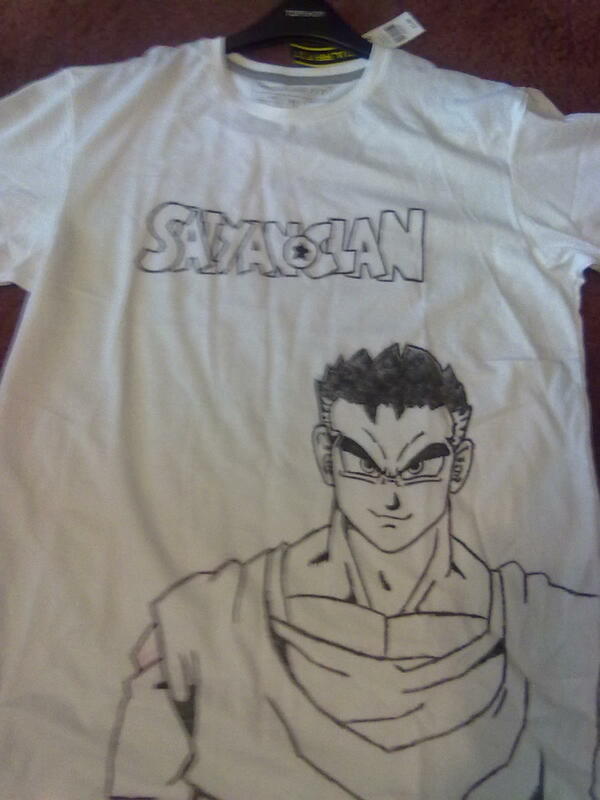 Digging through some old memory cards and files I thought I might as well post up a few older bits and pieces in the next few weeks and so I’ll start with this one-off Dragonball Z inspired t-shirt I made for a friend’s birthday last year. A gift for Cable from the Saiyans – early pioneers and current torchbearers of the UK Parkour scene who, as you can tell from their name alone, are massively influenced by Akira Toriyama‘s famous manga and anime series. I only have this one photo taken with my phone before I gave the shirt, so sorry for the slight blurriness. I got to Dragonball-ize Cable for this design, including the trademark (natural) silver highlights in his hair which inspired his moniker. I also put their group name in the Dragonball lettering style and wrote Cable’s name in Japanese katakana on the back. The drawing was done with Posca markers (yes, again, great on fabric too, they are awesome) over outlines made with tailors chalk. The shirt was finest Primark quality, cotton/polyester mix. This was the first and only t-shirt I’ve made, but I’m mulling over the idea of making a few new ones for myself. 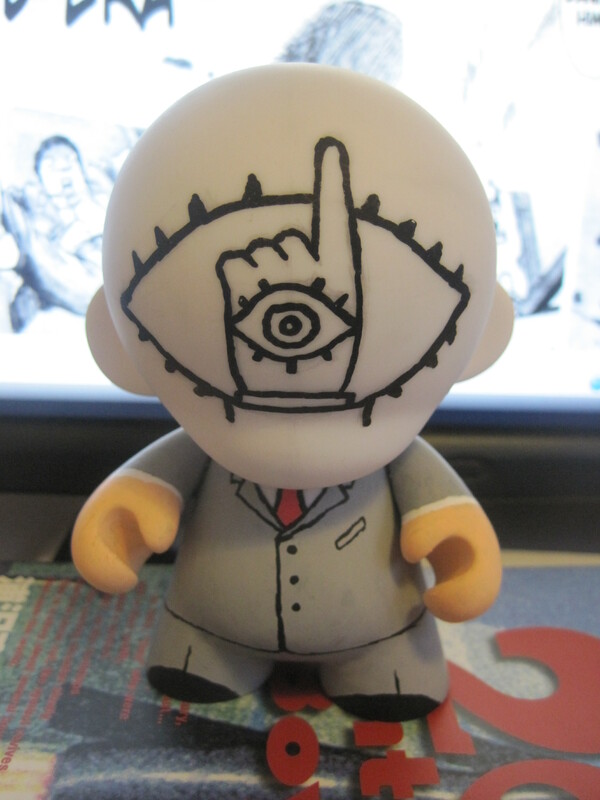 My latest munny toy creation is a character from the longest manga I’ve managed to read in its entirety, 20th Century Boys by Naoki Urasawa. My version of the enigmatic cult leader, Friend, comes with a reversible head which displays the Friend symbol on one side and one of the creepy masks he wears on the other. 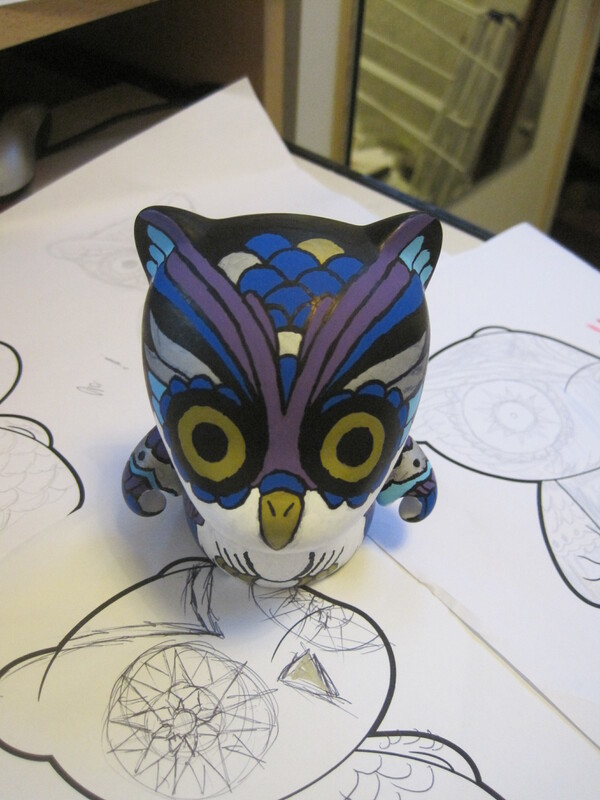 Designs were drawn directly on the vinyl with Posca paint markers with no primer. Hopefully I should be auctioning this one for charity soon too.